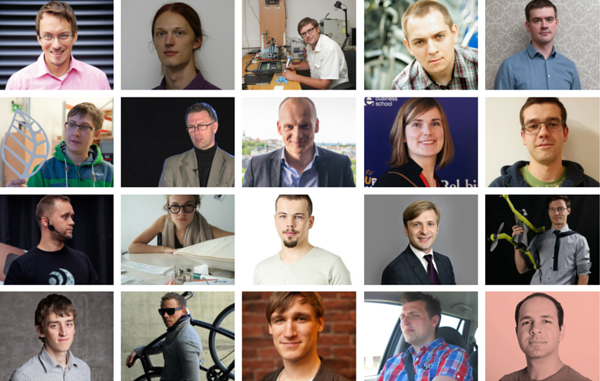 The 3rd Garage48 Hardware & Arts has officially kicked off in the ultramodern Physics Institute of Tartu University. This is actually the second time that this building hosts Garage48 H&A, said Jaak Kikas, head of the Institute of Physics. He noted that last year they had been worried about the consequences of the event, but as we all can see now, there was enough left over for the second event. This is the biggest H&A hackathon ever: this year the number of participants together with mentors and staff is around 200! The event is bringing together tech enthusiasts from all over the Baltics, and Denmark, Norway, Russia, Georgia, Columbia and the USA. Some returning, some here for the very first time. Garage is half-Latvian like Lotte cartoons,” noted organizer Priit Salumaa about the turnout. So what are they all doing here? They are engineers, designers, artists, team leads, marketers and dreamers. They are creating multinational teams that are going to give their everything in the next 48 hours to make ideas into working prototypes. They are simulating a start-up team, some even becoming one on the site. 1) Smart Bubble, presented by Max who hates to freeze his face off in winter. A bubble attached to the human head, uses heat from the body. Can integrate all kinds of extra features, also connected to a phone. Money comes from air filters + aroma. 2) Smart Health Monitor, presented by Jaanika, a fan of smart wearables. Stationary device for home use that integrates with and gathers data from different health monitors (blood pressure, blood sugar monitors etc.) and measures health condition in general. 3) E-Scape + Oculus ride. E-Scape, presented by Raul, an architect. Capsule with a treadmill and virtual reality inside. Goal is to encourage physical activity and thus improve health for people with desk jobs, it takes just 10 min in the capsule. For offices and school buildings. Oculus ride, presented by Adam. A virtual reality module for the fitness bike that simulates real experience. Cycling rift. To make fitness biking a more real experience. 4) Mechanimo, presented by Oleg who wants to build interesting things, but has grown out of Legos. Modular construction kit that allows to build useful machines that can be used as prototypes, prosthetics, robotics. Possibility to assemble a machine in minutes, no coding necessary. 6) Pilot, presented by Richards. A self-driving plug-in device for the car: sensors, an app, camera. Turns a regular car into a self-driving one. 7) Traffic Buzz, presented by Mart. A device that gathers traffic information and recycles it for usage, the outcome is seeing how traffic is behaving in real time. In ex. Advertisers can see how many people have seen their ad. 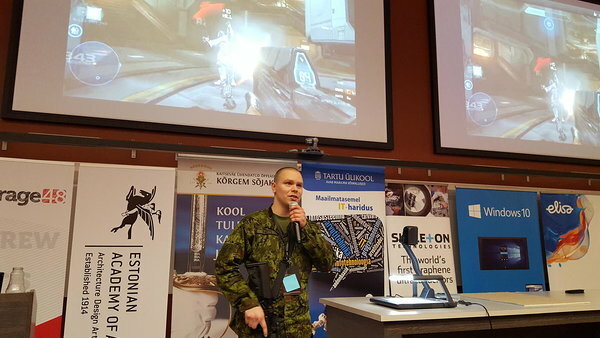 8) Infusion warmer, presented by Valter from the National Defence College. It’s a small lightweight heater at the end of the infusion line, just before the cannula. The point is warming up the fluid that goes into the body to avoid hypothermia. For first responders, military medics and ambulance services who don’t have a way to keep their fluids warm. 9) M-Sap Visualizer, presented by Egert, a device that processes sound into visuals. It can be integrated with stage lightning & other devices that create a unique show. 10) GuitarPi, presented by Jüri. Turn RasperryPi into guitar effects. RaspberryPi + Wolfson Audio Card + a nice box = an awesome guitar effect. 11) Keeni, presented by Ken, a master of biochemistry who was often bored in theoretical lessons at school. Keeni is a personal gene testing machine for students in biology class. Students can learn by testing their own genes. 12) Devil Inc., presented by Kristjan. T-shirts with LED screens that show advertisements, the wearer gets paid for it. 13) Intervallomeeter, presented by Jaak, a nature photographer. A device that takes photos every few minutes, but only during sunset and sunrise with the best light. 14) LanguageBOOM / LanguageGadget, presented by Kaia, a German teacher. A word explaining game consisting of a solid gadget in the shape of a bomb (that might go off any second) and a free app to encourage simple and efficient language learning. 15) Roundcounter, the killer app, presented by Joosep, a cadet. A device that counts how many bullets there are left in your cartridge magazine and displays the number on a screen. 16) Burger Queen, presented by Daniel from Lithuania. A robot that helps make burgers. 17) Smart Ramp for seabasing, presented captain Dieves. A ramp that automatically levels itself. 18) False Radio Network, presented captain Dieves. A device that sends out recorded radio signals that sound and feel real in order to deceive and distract enemies giving them false information on our location and activities. 19) Doorbell, presented by Kristiina. A doorbell for apartment buildings that phones the (selected) occupants and also produces a (one-way) video image of the ringer. 20) Tea machine, presented by Janis from Latvia. Measures temperature, lowers the tea bag and takes it out at the right time. 1) Illuminated bubble level for professional cameras, presented by filmmaker Edgars from Latvia. Put it on top of the camera, you can see it and get your camera in level without a tripod. 2) Poker Art, presented by Janis & Agia from Latvia. Bring online poker on your table. Poker set with smart chips, counts chips and an app that records and shows statistics. Poker tracker. 3) Smart sailing device presented by Vahur, a sailor. A unique device that measures necessary parameters, calculates and gives the sailor voice instructions. Helps beginners learning to sail, but also professionals who want to be the greatest. 4) “Logo” Core Human. A wearable device for personalized health monitoring, in ex. measures tremors in Alzheimer patients. Gives heath data to doctors, patients themselves etc. 5) Next Gen. Thermal Blanket, presented by Valter, a nurse-instructor for War and Disaster Medicine. A thermal blanket made of smart fabric that reflects heat and lets moisture out, possibly self-heating or with ion-fluids. For medics, hikers, first aid kits. 6) Portable minibike trenažöör, presented by Maria from Colombia. Make a portable minibike cheaper, portable and thus AWESOME. 7) Students Rookery, presented by Priit. A device to lift and keep students to the ceiling in small auditoriums (with high ceilings) short in space. 8) Stabilized running light. Small great design flashlight attached to the chest of the runner to run more conveniently in the dark. 9) Boosted snowboard, presented by an industrial designer from Lithuania/Corea. An electrical engine attached to the snowboard making it a whole new experience. 10) Catch Eye, presented by Aleksandrs. A device that makes a picture of a person entering an unauthorized space and sends a notification/picture to the owner/police department/Facebook page etc. 11) ElectricSurf. Electric surfboard to improve surfing experience, something like a water scooter with a battery that lasts. 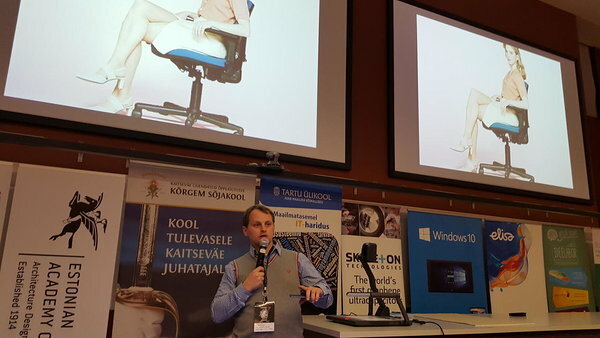 12) Smart chair, presented by Vilus. A device attached to the bottom of the chair that forces the sitter to move if they have been sitting too long. 13) Otoscope, presented by Tatjana. Hands-free, digital otoscope (a microscope that investigates the ear) with built-in sensors and lighting that takes pictures and sends them to your doctor + software. 14) Personal Assistant. Bluetooth handset + Siri → a device controls everything, makes searches on the Internet and is trainable. 15) Motorcycle crash detector, presented by Andres from Kenya. A device that can be hooked up to a motorcycle and calls friends, family and medical services if an accident occurs. 16) Bike stabilizer, presented by Janis from Latvia. A device in the shape of a backbag that keeps a bike in balance. 17) Mechanical table that goes up and down forcing you to move. No motors! No electronics! Presented by Janis from Latvia. 18) Sensor that analyses the patient’s movements during a scan. Presented by Renard, a medical physicist. Goal: reduce risk, improve image quality, optimize patient treatment. 19) Lamp of arrival, presented by Frituf. A lamp that lights every time someone arrives at the beach of Lesbos. To get a sense of the mayor migration and possibly get some statistics. And what are they all working for? Of course, there are prizes. There’s going to be a best tech prize, best design, best marketing and also special prizes from Microsoft, Prototron, Estonian National Defence College and the Garage48 Hub. But the prizes definitely are not all. This event is about getting real start-up experience, pushing one’s limits, making friendships, fulfilling dreams and maybe starting working companies, here and now. Seems I’ve forgotten something… oh, yes, it’s also about having FUN. Plus, tomorrow the teams can look forward to be mentored by these amazing expert mentors. Good luck to the teams! See you in 48 hours!